About three decades ago, Christopher Greicius, a young boy in the US who was suffering from Leukemia wanted to become a police officer. His worsening health would have never let his wish be fulfilled. Christopher was miserable until a family friend and the local police department made Chris the first honorary DPS patrolman in their State’s history. On May 1, Chris was presented with an official uniform and the officers arranged a motorcycle proficiency test so he could earn wings to pin on his uniform. Chris passed the test with flying colors on his battery-operated motorcycle. On May 3, Chris passed away with his wish fulfilled. Gandhar Joshi of Mumbai who was also suffering from Leukemia in 1995 has a similar story. Gandhar wanted to see Disneyland and agreed to go to the US for treatment on the condition that he be allowed to visit Disneyland. In the course of his treatment, Make-A-Wish Foundation volunteers met the Joshi family and went about fulfilling Gandhar’s wish in a way that surpassed all his expectations. They few in his sister from India to join the family on a 6 day trip to Disneyland. Gandhar passed away soon after their return to India. Chris inspired his mother to start Make a Wish Foundation and Gandhar inspired its Indian chapter. Since 1980, the Make-A-Wish Foundation has given hope, strength and joy to children with life-threatening medical conditions. From fulfilling one boy’s wish to be a police officer, they have evolved into an international organization that grants a child’s wish every 40 minutes. Toys, clothes, visits to theme parks, wishes to become a doctor or lawyer. The list is endless. Make - a - Wish has truly given these children what they have wished for. 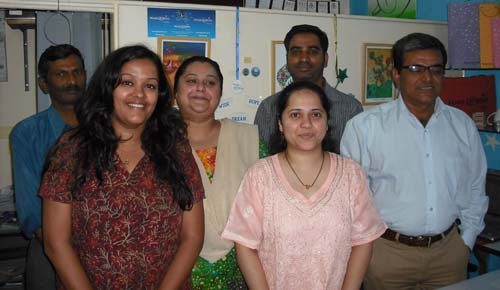 We spoke to Mukul Gupta, CEO of Make-a-Wish India, and his team, on March 12th. We discovered that Make–a–Wish has fulfilled 16371 wishes. Volunteers are the backbone of this organization and in Mumbai alone, they have 75 dedicated housewives as their field volunteers who identify wishes and also help with the wish granting process. They have partnerships with hospitals and clinics that refer ‘wish children’ to them. They have offices in Ahmedabad, Pune, Bangalore, Coimbatore, Goa, Hyderabad, Jaipur and New Delhi. The wishes are categorized into – ‘I wish to be’, ‘I wish to go’, ‘I wish to meet’ and ‘I wish to have’. Some interesting wishes they have fulfilled include a wish to be a teacher, to go to a zoo, to meet Sachin Tendulkar and to have a Playstation. The unending stories of humble wishes and the happiness of having them fulfilled touched our heart. If you are interested to know more, do visit Make-a-Wish’s website. You can also write to them on info@makeawishindia.org.